John Higginson, author of The Way of St James: A Cyclist's Guide, continues his cycle tour to Santiago de Compostela with this guide to the stretch linking Conques to St-Jean-Pied-de-Port. Having paid your respects to the rather over-the-top statue of St Foy in the cathedral treasury, ride down the steeply cobbled street, collecting sustenance on the way, and cross the River Dourdou by the Roman bridge and commence a very long climb until a chapel appears on the right. A tour of the inside makes the climb worthwhile. The stained glass after the austerity of that at Conques is wonderful. Ride the ridge with views of Decazeville down to your left. Ignore it and pass through the sleepy little village of Livinhac L’haut before climbing through Montredon to reach St Felix with its tiny tympanum. The busy little town of Figeac will soon appear. It's home to a copy of the Rosetta Stone – Jean-François Champollion, who broke its code – was born here; there's a museum in his honour in the town. There are several routes out of Figeac, but the most spectacular is that following the banks of the River Célé. Here the river has cut a series of gorges and rock tunnels, creating wonderful landscapes. Pass by the ruined abbey at Marcilhac-sur-Célé to visit the caves of Pech-Merle, said to contain the finest prehistoric cave paintings outside Lascaux (in French). After your visit (up a very steep approach), ride on to cross the bridge over the River Lot and immerse yourself in the picturesque village of St-Cirq-Lapopie. A steep drop from here will bring you back to the River Lot at a troglodyte castle overhanging the road. Turn left and ride along the valley floor dotted with market gardens until it reaches Cahors. Your welcome here should be great, with a large tourist office and no less than two pilgrim welcoming posts, one on the bridge for physical needs and one in the cathedral, for spiritual sustenance. 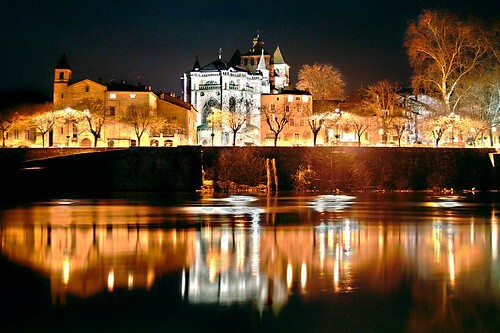 If you can, spend some time in Cahors – it will repay you handsomely. It also has direct trains to Paris if you need them. Pass through Quercy Blanc, a wild area, to visit Lauzerte and on to Moissac. The scenery here changes subtly; rolling hills replace the steep gorges. Market towns flourish, though there are long distances between them. Lectour, built on a bluff of land, provides overnight accommodation, although windowless rooms in the gîte seem strange. A short ride brings one to the strangely named Condom. In France the town is famous for its Armagnac rather than for its ‘preservatives’ although there is a museum to both. Beyond Condom lies Larressingle. My advice is to visit it as long as there are no coach parties there. Passing through Armagnac villages reach Eauze and on to Nogaro and, shortly afterwards, Aire-sur-l’Adour. Here, search out the church dedicated to Ste Quitterie housing the most remarkable sarcophagus. Now ride through the country known as the Béarn; rich forests abound and one can see why the king of England had his parliament here. Pass through Navarrenx with the Pyrenées coming clearly into view. Notice that the place names seem strange here as we are entering the Basque Country. Although it is not technically on the route, ride into St Palais and find the marker where the Le Puy, the Vezelay and Paris tracks meet before their journey into Spain. Ignore this path, however, and retrace your route as far as the D933 and head for St-Jean-Pied-de-Port. On the way, visit the strange church/barn at Harambeltz and the ancient hospital town of Ostabat. The Spanish border town of St-Jean-Pied-de-Port can be an anticlimax to the much-travelled pilgrim, filled as it is with trinkets and souvenirs, but it does provide plenty of accommodation for cyclists as they contemplatie the ride on to Santiago de Compostela. See our introduction to cycling the Way of St James, as well as The Way of St James: Le Puy en Velay to Conques, and The Way of St James: Alternative Routes. John Higginson is the author of The Way of St James: A Cyclist's Guide. A keen cyclist in his youth, he took up cycling again after retiring from teaching. He is now a professional writer and lecturer. He is also the author of the Cicerone guides Cycling in the Loire: The Way of Saint Martin and The Danube Cycleway: Donaueschingen to Budapest. He lives in France only a few kilometres from the pilgrim route and can often be found helping pilgrims in Cahors Cathedral during the spring and summer months.